This week is National Volunteer Week! Volunteers play a vital role here at Cloud & Fire and their time, support and efforts are greatly appreciated by staff and students alike. 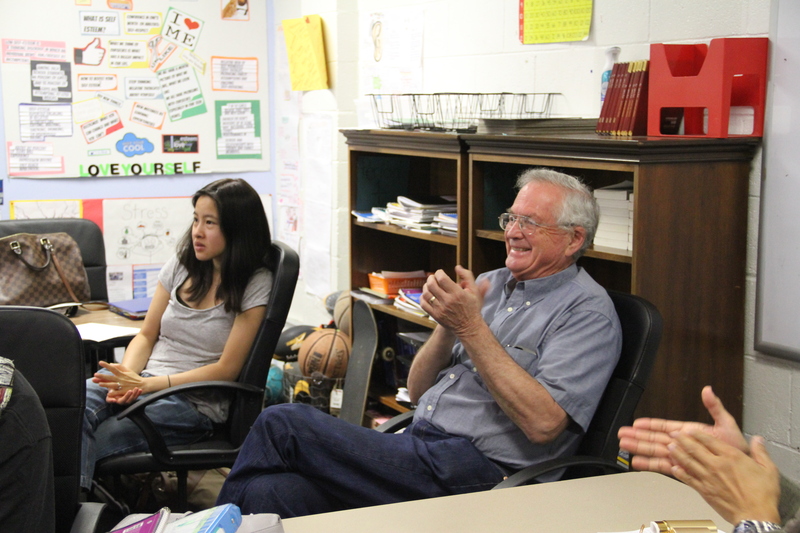 Our volunteers participate in admin assistance, tutoring, handyman work, events and much more. We welcome anyone interested in helping students to survive, strive and thrive! Dave cheers on a student as they successfully solve a math problem they were struggling with. Next to him is a another one of our wonderful volunteers Livia. Three years I think. I’d have to stop and compute, but I’m pretty sure it’s been three years now. How did you first hear about Cloud & Fire? What made you want to get involved here at Cloud & Fire? Well, two things: I needed to do something meaningful with my time after retirement. The second is that I see kids who for one reason or another have had their education messed up but they’re trying to get themselves back on track and I want to help them. In what ways do you volunteer? The big time thing this year has been tutoring. I’m not a teacher, I’m a tutor and the difference is that I help people usually one-on-one or two-and-three-on-one. I don’t have to come up with the lessons I just follow along with what the teacher is already teaching. In years before this I would do that as well as handyman work. So if I saw some light bulbs out or something I would fix it. I did teach a woodworking class my second year but the trouble with that was coming up with something and then getting people to actually do it. I’m much better as a tutor. What are, if any, some of the challenges you face as a volunteer and how do you overcome them? Of course, the bigger issues are some students are still kids and they haven’t quite recognized that they have to get it together just yet. It’s harder to work with those types of students but it’s a matter working past that and at times asking the teachers for assistance. But the attitude problems aren’t significant. They do happen, but with a really small number of the students who are here. Most of them are trying to do better and are simply struggling. I learned something maybe a year or so ago from a newspaper article. It touched on math, which is a subject I tend to assist with predominantly here. It said that if you don’t get comfortable with the basics of math early on in childhood you will likely not be comfortable later on. None of these kids are comfortable with math and giving them comfortability is a real struggle—but it’s worth trying to accomplish. It’s like learning how to swim. Once you’re comfortable with the water the rest of it comes easy, but until you’re comfortable with the water it’s impossible. And these kids are not comfortable in the waters of math just yet and I want to help them do better. To see kids get the material. Because most of them are fine people, but just don’t believe that they are or that they can because they don’t hear it that often. It’s good to be a part of helping them believe in themselves and know that they can get the material. Interested in joining Dave and the rest of our wonderful volunteers–make your own positive imprint on a student’s life. Contact Claire at claire@cloudandfire.org or visit our website for more details. Race it Forward season is in full swing here at Cloud & Fire Ministries! As we prepare for a great event full of community service, fellowship, and fitness education, we want to highlight why one of our own will be running this year. Carlos Gomez, Cloud & Fire YouthBuild P.E. and math teacher extraordinaire, agreed to sit down and talk with us about his goals for race day! How did you hear about Cloud & Fire Ministries? Why you were drawn to be a part of the cause? I first heard of CFM through a Craigslist posting my pastor gave to me. He gave me the posting because I was a teacher in Simi Valley but a youth pastor in North Hills and he knew that I had a desire to somehow blend both. CFM was not only the perfect blend of my two passions, ministry and education, but was also in my ideal location. I was drawn to the heart of the ministry. Equipping young adults in my community was a blessing and a mission I could definitely get behind. Why did you get involved with “Race it Forward”? Race It Forward is a win-win! People who get involved are doing something that’s good for themselves and others! Running makes you feel good, especially if you have your own personal health goals. Race It Forward will give you an opportunity to display your progress, improve, and be filled with a sense of accomplishment! Plus, what could be nicer than a beautiful day out by the beach? We are helping our organization continue to do what it does best, changing the lives of youth in our community. How do you think this race will benefit Cloud & Fire students? (Whether they run in it themselves or just through raising money for counseling services). Students are going to benefit from participating because I think that we as a program really touch on the importance of self-care via exercise. I also don’t think many of our students have experienced an organized run before and it feels great to be part of something bigger than yourself. You start, you push yourself, and in the end are awarded for your efforts. It will be a day they will remember for a very long time. I have not specifically been training for this race, but I have stayed active! I started CrossFit in January and do that 4-5 times a week. It’s intense. Many of the CrossFit workouts revolve around running, so in a way I guess you can say I am training. I’m also the team sports class teacher and I occasionally train with the students. I already have the upper hand. You see, I’m committed to beating 2014 Silver medalist, Mr. Ren (Mr. Ren is the Government, Economics, and Leadership teacher at Cloud & Fire and is good friends with Mr. Carlos.) I heard a rumor that he might not even run! I challenge him to the 10K, if he chooses to do the 5K, it’s because he wants to stay away from me! What is your motivation to run this race? Why should other people sign up? My motivation to run this race is really to get out there with members of CFM, staff, students, volunteers, and other supporters and just enjoy a day of exercise for a good cause! It’s going to be a great day and I don’t want to miss out! Also Mr. Ren, I need to beat Mr. Ren. Do you have a favorite run? If so, when and where was it and why is it your favorite to date? Race It Forward 2014! It was also in Santa Monica. It was nice to take in the ocean, beautiful mountains on the horizon, the Pier, the gorgeous homes. The Venice to Santa Monica running path is definitely my favorite! Three words that describe your running. *Efficient. *Contemplative. *Therapeutic. Do you have any pre-race superstitions/rituals? Yeah! My shoe-laces can’t be too loose or too tight. I find myself tying my shoes multiple times before a race. I need to get them just right! What type of music pumps you up before a run/race? Do you have a favorite running motto? You’ll hate me at the start, but love me at the end. After Race It Forward 2015 my next race will probably be…Race it Forward 2016! 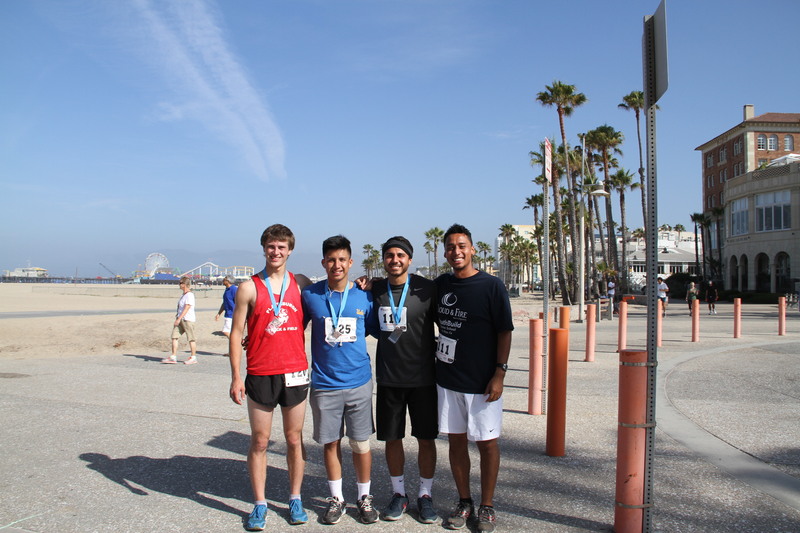 Race it Forward takes place on Saturday, May 2nd, in Crescent Bay Park, Santa Monica at 8am sharp! For more details on how to register, visit cloudandfire.org/raceitforward.